← Crib to Bed: What it’s really All About! 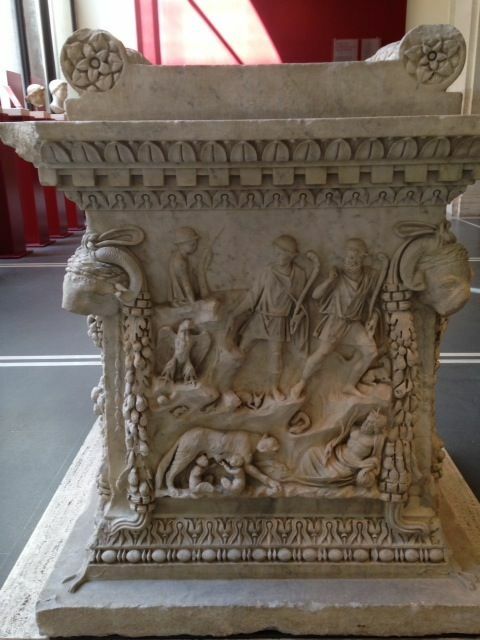 As you know, I like to do some carving from time to time but after experiencing the antiquities of Rome last week can only say that I “dabble in carving” at most! Diane and I were able to spend a week there and see works that are totally unbelievable in their scope and execution. This photo is one of many illustrations to emphasize that. I’m trying to work primarily with a soft material; usually basswood. The sculptures and carvings I experienced there were granite and marble and thousands of years old! No hi-tech metals or computer aided design —– this is man at his best and I was in total awe at the amount and quality of art work we saw. I could go on and on but if you look at the detail in the picture I think you’ll understand my amazement. Can you imagine living at such a time as that? I doubt there was such a thing as minimum wage back then but I’m guessing that just like now, working at an artistic endeavor probably paid less than the minimum wage. Who knows, many of the people working at that time to create the buildings, sculptures, architectural moldings, and frescos may have been slaves brought from foreign lands the Romans had conquered. I may never achieve the expertise and level of work seen on our vacation but am blessed to be able to enjoy the process of my hand work and strive for whatever level I can achieve — there’s always a new goal to aim for! I’m really happy that my wife has picked up her paint brushes again. When the economy soured in 2008, galleries that she was in closed as people’s disposable income became less. One aspect of her painting was that I could collaborate with her and do her frames. She had custom moldings cut by Foster Planing Mill which I would cut, join, carve, and gild to complement her paintings. It’s been quite a while since I’ve had the opportunity to do that so it’s good to do it again. On our evening doggie walks we pass by a fig tree. I really admired the shape of the leaves so one day took a knife to take a few home with me to use for inspiration. A short length of the molding was modified and joined to create my sample corner. 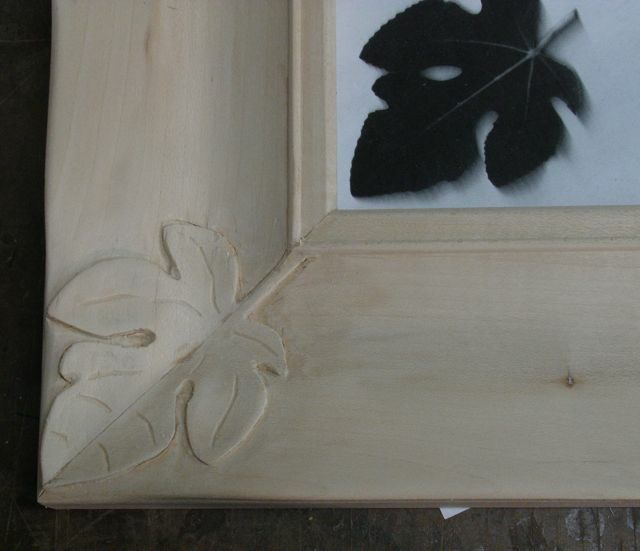 Another thing I’ll be experimenting with on this frame is a red, variegated leaf. I’ve gilded with Dutch gold, aluminum and copper leaf, and also precious 22 karat leaf. This frame will be oil gilded and I plan to do a short tutorial on the process. The first step though was making a template from the proper sized leaf that I cut from the tree. When using an image to create the template it’s easy enough to simply scan it, size it accordingly, then cut it out of a piece of metal. As you can see in the picture at the right, laying an actual leaf on the scanner and making a copy resulted in a fuzzy outline. What I ended up doing was to take a piece of plastic from some packaging and covering it with double stick tape. 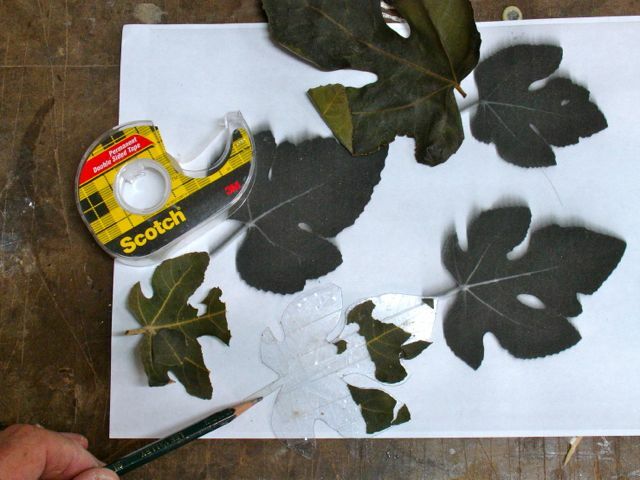 The leaf was then pressed onto it and cut out, the pencil is pointing to that template. It’s better and easier to have a template that can conform to the curves of the picture frame than trying to lay a piece of carbon paper and tracing it. Also, you can flip it over for a mirror image on opposite sides of the frame. My carving is a work in progress, actually I suppose everything we do is something “in progress” if it’s the process we’re interested in as much or more than the final project. Carving on the mitered corners of a frame has its own set of challenges because of the grain directions but I think this fig leaf turned out pretty nicely. This fig leaf will be an embellishment to each corner. The wow factor will be the variegated leaf I intend to use. Even though I’ve never used this type of leaf before I can tell that it’s going to be the star of the show! It’s pretty amazing in appearance and I just hope it won’t overshadow the painting the frame is intended for. I noticed on the package that it’s made in Italy which seems fitting seeing how we just vacationed there! If you’re unfamiliar with gilding there are two basic methods. One is referred to as water gilding and it is used with precious metal; 14k to 23k gold, also silver. The process uses many coats of gesso to seal the frame and then adds multiple coats of colored clay as background for the thin sheets of gold used in the process. Very time consuming and exacting and with the price of gold not one I can afford. The other type of gilding is oil gilding. In this process you use what’s referred to as Dutch or schlag metal which is a composition of brass, copper, tin, and other metals. After the wooden frame has been sealed with a clay like primer, a thin coat of oil based adhesive is applied to the entire frame. This is referred to as gilding size and is available in quick set (1-3 hours) and slow set (24 hours). For the sample I’ll use the quick set but for complete frames prefer the slow set. Once the size has reached the proper tack you lay the sheets of schlag metal on them — sounds easy enough but there is a certain skill level required — hope I still have it! Burnisher/Sealer — note how thick it is due to a high clay content. After thoroughly stirring up the burnisher/sealer it is applied to the frame. It’s important to lay it down as smoothly as possible, brush marks will telegraph through the leaf. Once it’s dry you can lightly sand if needed followed by 4/0 steel wool that will burnish the surface. In the oil gilding process, the leaf mimics the texture below it so the more you burnish prior to leafing the nicer your surface will appear. With water gilding and precious metal, you can burnish the gold leaf itself with an agate to make it shine like gold does. You’re actually pressing the gold onto the gesso and bringing out it’s natural luster. If you’re not familiar with frames and gilding this may seem confusing to you. A 22k gold leafed frame could be priced at $1000.00 while a similar sized frame done in metal leaf may be 1/5 of that cost. Can you see the difference in the frames? absolutely! When viewed side by side the metal leaf will appear brassy or garish compared to the precious gold frame. Metal leaf also needs to be sealed to prevent tarnishing. I will explain the process as my work on this frame continues. This entry was posted in Carving, Picture Frames and tagged Dutch gold, fig leaf, oil gilding, variegated leaf. Bookmark the permalink. The corner leaves on the frames are looking great John. I’m looking forward to seeing them gilded. Keep havin’ fun with the carvings.